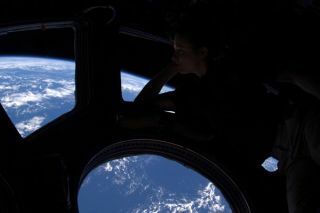 NASA astronaut Doug Wheelock took this photo of his crewmate Tracy Caldwell Dyson looking out the International Space Station's cupola window. Wheelock posted the photo on Twitter Sept. 15, 2010, writing, "Tracy in quiet reflection of an incredible journey." During her six months on the International Space Station, Americanastronaut Tracy Caldwell Dyson experienced lots of laughs ? and lots of stress. Caldwell Dyson, of NASA, returned to Earth Sept. 25 with two Russian crewmatesaboard their Soyuz spacecraft, capping a mission that included three emergencyspacewalks to fixa broken cooling pumpthat is vital to the station. "Ithink anything of that magnitude can be a little stressful at times, but stresscan be quite a motivator," Caldwell Dyson told SPACE.com Friday (Oct. 15). "I think the stress we felt was just the criticality, the nature of whathas failed and the importance of getting out there and getting it fixed. But therewas tremendous focus, not just on orbit but on the ground." Sheand fellow American astronaut Douglas Wheelock successfully repaired the pumpduring their spacewalks and got the station back in good health, with help fromtheir crewmates Alexander Skvortsov, Fyodor Yurchikhin and Mikhail Kornienko ofRussia, and Shannon Walker of NASA. Therewere also light moments, including jokes shared round the dinner table in theevening, and weightless hijinks. "Iwould say some of the funnest parts are of course when you're lookingout the window orwhen we have a vehicle that's arriving, be it a Progress ship or one that's actuallycarrying people on it ? those are exciting moments," Caldwell Dyson said. Duringher time on the space station, Caldwell Dyson also became the first astronautto deliver an address in sign language. In July she recorded a videofor deaf children togive them a glimpse of what life as an astronaut is like. Ultimately,her space mission was a blast, she said. "I'dsay overall it just went perfectly for me," she said. "It was aperfect length of time filled with great moments, great people." Itwas the second trip to space for Caldwell Dyson, who flew aboard the STS-118space shuttle mission of Endeavour in 2007. But it was her first trip back toEarth aboarda Russian Soyuz capsule, which offers a different, sometimes rougher ride than the shuttle. "It certainly didn?tdisappoint," she said of her ride home. "It was pretty exciting andall the bangs, bells, whistles and sensations were there. The magnitude of somethings were a little surprising, but for the most part it was a pretty excitingride."